While all of this seems great, especially for sleep-deprived college students, it’s important to think about some of the side effects of the ingredients in these drinks that might not make them so appealing and could potentially be extremely harmful. A recent US report found that there has been an almost doubling of energy drink-related emergency room visits between 2007 and 2011. Many of these side effects stem from the high amounts of sugar and caffeine as well as many of the other caffeine-like substances found in many of these products. Specifically, high doses of caffeine have been associated with restlessness, anxiety, irritability, trouble sleeping, headaches, dehydration and increased heart rate and palpitations. More serious adverse events that have been associated with the consumption of energy drinks include seizures, mania, stroke, and sudden death. The potentially lethal cardiac effects that have been reported were commonly associated with those patients who had underlying cardiac disease. Therefore, it is especially important for these individuals to avoid or at least limit the use of these drinks. Many of the more serious adverse effects were found at caffeine dosages greater than 400 mg per day, and consumption of 5-10 grams can be lethal. Many of the energy drinks we commonly use also contain a number of additional ingredients. Although not a comprehensive list, below are some of the reported side effects of those ingredients. Many of these side effects are more pronounced at higher concentrations of these ingredients and each individual will respond differently. Also, because the dosages and caffeine content of these are not required on the product labeling, it’s important to be cautious when ingesting these beverages. 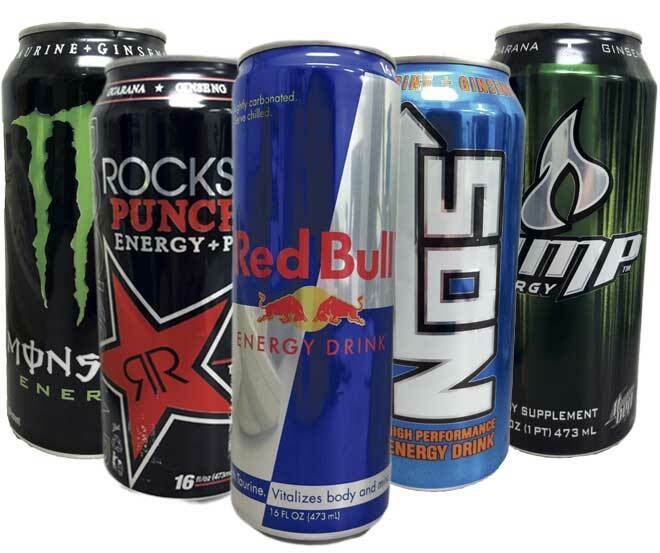 Regulation of energy drinks differs from that of traditional caffeinated beverages, such as cola and coffee. In the United States, these products are classified as dietary supplements and as such are tested and regulated differently than conventional foods or drugs. The FDA is responsible for taking action against any unsafe dietary supplement product after it reaches the market. This means that manufacturers of these products do not necessarily need to register their products with the FDA (although they may choose to) or get FDA approval prior to producing or selling these supplements. Because of these regulations, manufacturers also do not need to report dosages on the package labeling. This is in contrast to the manufacturing of foods and beverages. Beverages, such as Coca Cola®, are not classified as dietary supplements and therefore must be registered with the FDA and must comply with strict manufacturing requirements including proper labeling with accurate dosing. The FDA does have the authority to impose certain restrictions on beverages. For example, a 12 fl.oz. can of Coca Cola® has an FDA imposed caffeine limit of 71 mg.
Energy drinks are consumed by millions of people worldwide and continue to be an important supplement used by many college-aged students especially around exam time. Although these drinks seem to have many beneficial effects, it is important to remember the many adverse side effects associated with their use. Always read the labeling on any product and be informed of the ingredients and potential interactions with other medications as well as their side effects and keep in mind that because they are not as strictly tested or regulated as prescription medications, dosages may vary by batch. In general, the consumption of energy drinks should be avoided if at all possible. If you’re really in need of that extra boost, try grabbing a quick nap instead! For more on energy drinks. 2. Seifert SM, et al. Pediatrics. 2011 March; 127(3): 511–528. 3. Harland BF. Caffeine and nutrition. Nutrition 2000; 16:522. 4. Juliano LM, Griffiths RR. Caffeine. In: Substance Abuse: A Comprehensive Textbook, Fourth Edition, Lowinson JH, Ruiz P, Millman RB, Langrod JG (Eds), Baltimore: Lippincott Williams, & Wilkins, 2005. 7. SAMHSA: Drug Abuse Warning Network. Update on Emergency Department Visits Involving Energy Drinks: A Continuing Public Health Concern. 2013 January. Previous Article The Forgotten Dimension of Wellness?